The Serengeti including the Masai Mara (Kenya Side) is famous for the mass migration of zebras, wildebeest and Thompson gazelle’s. We had the opportunity to see massive herds of these animals in a diversity of landscapes. 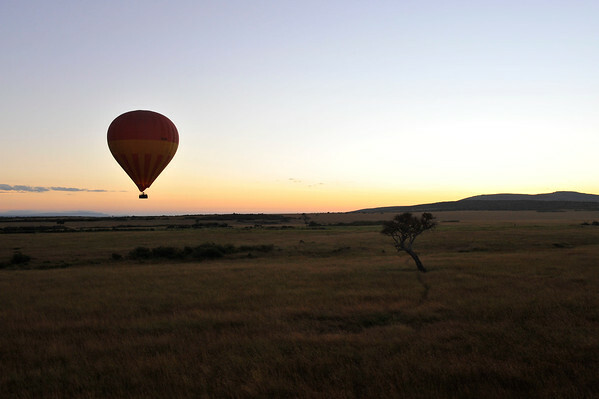 We decided to get up very early in the morning and take a balloon ride across the plains. Although the migration was just starting in this area and we didn’t see a huge number of animals, the sunrise and sites we saw were outstanding. At one point when we just cleared a hill full of vegetation, a mother elephant trumpeted her warning to us to stay clear of her baby. We had a formal breakfast on the plains, then went off on a small group safari. The four of us that went on the balloon ride, were fortunate to see our first leopard. We were crossing a small stream and the cat was hiding in a tree above us, only about 20 feet away. Unbelievable. It didn’t hang around for long and didn’t give us that great photo shot, but it was a great moment in out trip. We stopped at the lodge of choice for their president and other VIPs where we met up with the rest of the tour. The hippos gave us a great display of mating thrashing around in the water. Later in the day we approached the Mara river, famous for the wildebeest charging into the crocodile infested waters. One of the crocodiles was waiting by the water for supper to come by. It was close to here, near to the very dry Sand River, that we saw our only snake and a land turtle in the wild. The next day we went on safari again and then made our way back to Nairobi ending the third segment of our journey.